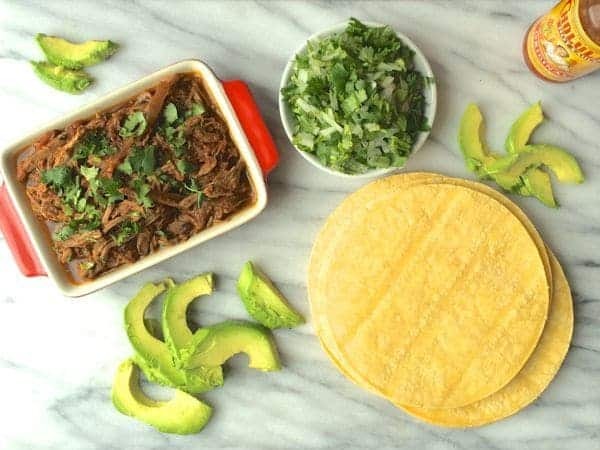 These simple pulled beef tacos are made with warm corn tortillas and topped with creamy avocado, minced onions and fresh cilantro. 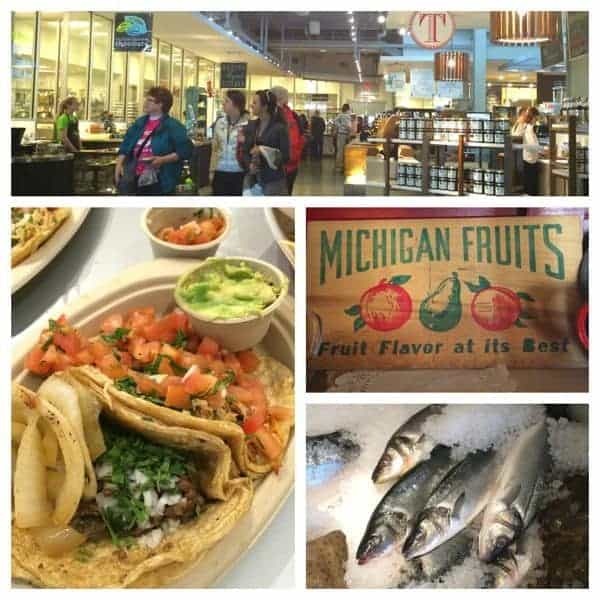 If you follow me on Instagram, you may have noticed that I love frequenting the new Downtown Market here in Grand Rapids. A combination indoor/outdoor marketplace, it reminds me of a mini Chelsea Market full of food stalls, local vendors and more. 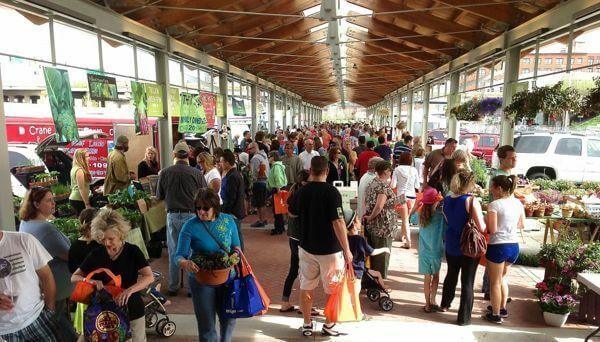 From May – September, there is an outdoor portion with over 50 local farmers selling fresh produce, breads, honey, cheeses and more. Basically, it’s foodie heaven and I am so lucky to live just 10 minutes away. Whenever I visit, I try to sneak in a quick bite at Tacos El Cunado located in the indoor portion of the Downtown Market. 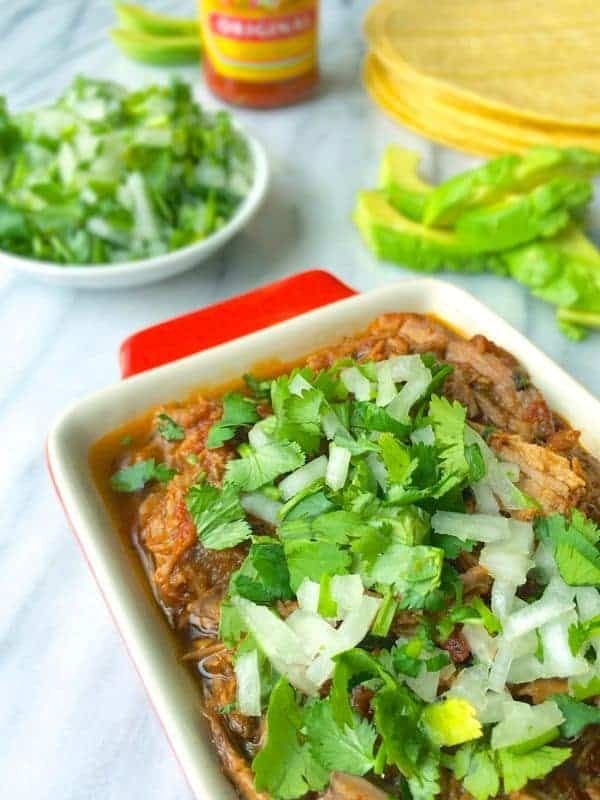 Authentic Mexican street food, their tacos are made with locally produced corn tortillas, succulent meat or shrimp and plenty of fresh cilantro and minced onions. That’s it. No shredded cheese, no sour cream, no triple corn quinoa mango salsa. It is simple, delicious and perfect. Pulled Beef Tacos with Avocado, Onion and Cilantro are my way of bringing the taste of the Downtown Market into my own home. The serving size is two tacos but I certainly won’t be judging you if you decided to triple that. 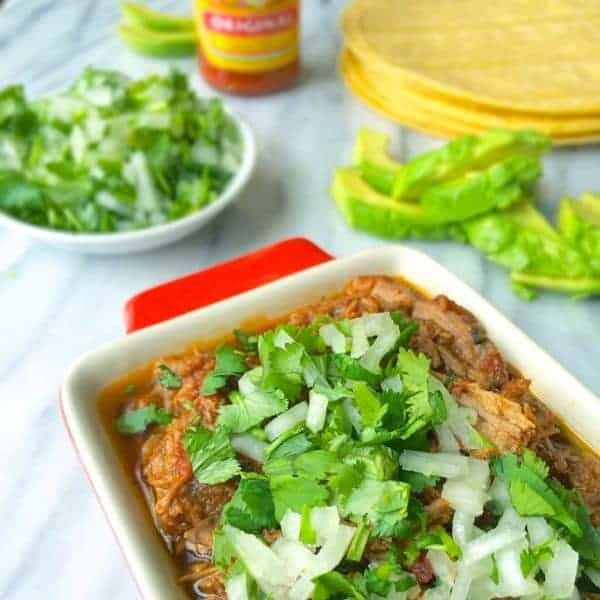 These simple shredded beef tacos are made with warm corn tortillas and topped with creamy avocado, minced onions and fresh cilantro. Wrap tortillas in a kitchen towel and microwave 20 seconds to warm. 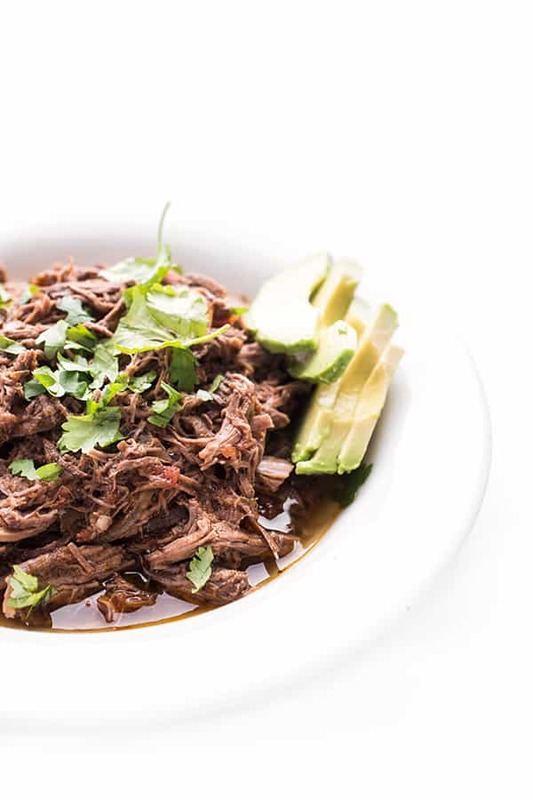 Divide shredded beef evenly between 8 tortillas (1/4 cup each). Top each taco with a few avocado slices, 1 tablespoon minced onions and 1 tablespoon cilantro. Serve with hot sauce and plain yogurt. Feel free to use any leftover meat or protein you have on hand such as grilled fish, pork tenderloin or pulled chicken. 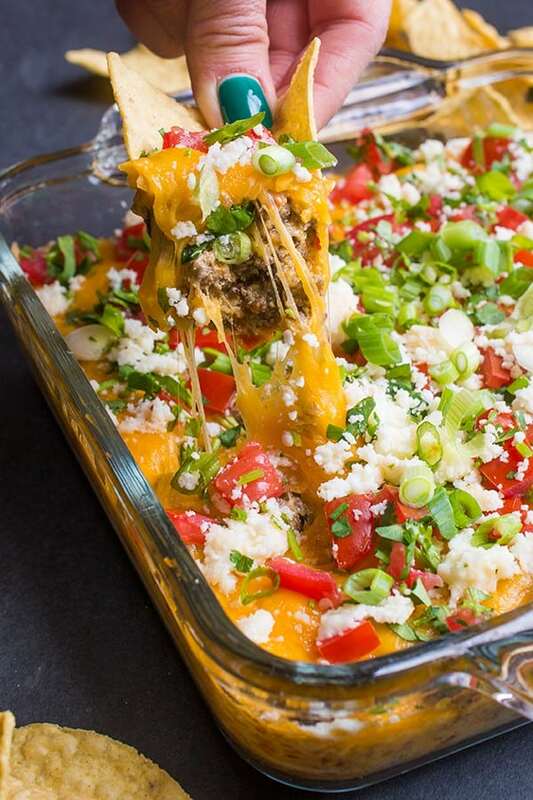 These look so flavorful and perfect for my weekend football party! Thanks for sharing, Liz, and Happy New Year! Happy New Year to you too Kelly! No sauce! When you slow cook beef it creates an amazing broth because it doesn’t evaporate! This was super! I served it with black coconut rice and roasted brussel sprouts … and my husband loved it! Oh I’m so glad!!! Thank you for letting me know! Oh man so awesome you can walk there!!! These sound wonderful. I would have to forget the onion, because raw onion and I don’t get along well :-( Authentic Mexican food is always a winner with me. I hope you like it Susan! Perfect! 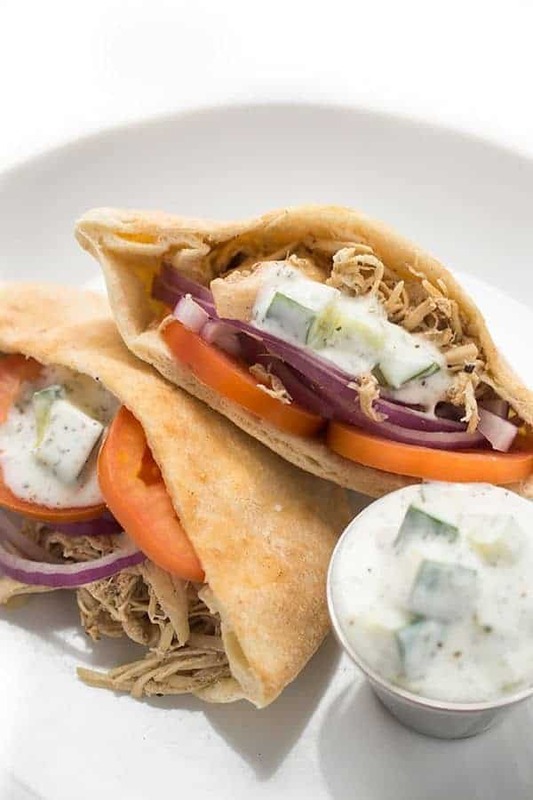 The simipilist recipes are always the best and this looks yummy! Yum! What a delicious recipe! For some reason, my family really prefers flour tortillas. We like corn if they are fried… but maybe just a few seconds in the microwave will do the trick. Thanks for sharing! Trust me I get it! My husband prefers flour also. These would obviously be fabulous with either!! Sometimes simple is the way to go! I can just taste that juicy beef! That Farmers Market looks amazing and so do these tacos! Awesome recipe LIz! For reals? GAH!! Now, I want this for lunch! Also, so stoked to see you on Thursday!!!!! Me too!!!! Ahhh it’s almost here! I’ll trade you tots for beef tacos? LOVE these. Tots for tacos? DONE AND DONE! Aww thank you so much. I try not to take it for granted- we really are so lucky! That pulled beef looks amazing! I’m a sucker for pulled meat!! Simple yet profound, these tacos look scrumptious. YAY!! So glad you won the book!! Congrats! These look so phenomenal! And I think I’m going to start my own downtown market in Sterling Heights. I clearly can’t live without it. Love tacos ~ these look simply delicious! You are so lucky to have such an amazing farmer’s market so close by!! I really am lucky – thanks so much!! My favorite kind of dinner! I thought of you when I opened the perfect avocado!! I wish I had a good Farmers market close by! They look so awesome! These tacos look fab Liz! You can never go wrong with anything taco, or adding avocado to anything! pinned!